Iolite Partners commentary for the half year ended June 30, 2018. For the half-year ended June 30, 2018, the unleveraged portfolio returned +14.4% in CHF (+15.3% in EUR, +13.0% in USD) net of all fees. 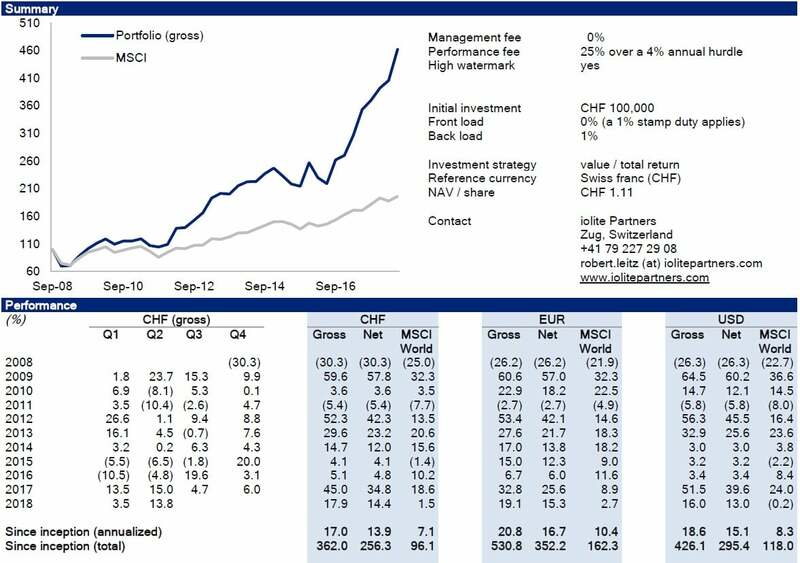 Since inception on October 1, 2008, the portfolio has generated net annual returns of 13.9% in CHF (+16.7% in EUR, +15.1% in USD). In other words, a Swiss franc invested at inception has turned into CHF 3.56 (a euro invested has turned into €4.52 and a dollar invested into $3.95). The outstanding performance over the last few quarters has attracted attention, leading potential investors to ask me two questions: 1) what is your view on the market (it seems expensive), and 2) do you have dry powder left? First, I generally do not have a view on the overall macro environment. I tend to invest bottom-up and worry top-down. This means I focus on picking assets at good prices and then consider macro risks that could impact my investments. That said, it seems most people I speak to are bearish — they point out that the last major correction was 10 years ago, and many fund managers complain about the lack of investment opportunities. In my experience, widespread caution and pessimism is not a sign of a market peaking. There may well be bubbles in select areas such as technology or high-yield bonds, and there is always the chance of a sharp market correction due to broader risks (e.g. wars, trade wars, large bankruptcies, etc.). However, I do not think the global stock market is necessarily overheating as a whole. As long as I can find stocks that offer attractive risk-reward profiles in a boom-and-bust scenario, I will continue to deploy capital. I do not fear volatility, but permanent loss of capital. Second, a good portfolio manager should ask himself every day: if I were to build my portfolio from scratch, would it look like the one I currently own? I can say this is the case of the portfolio as it stands today. Even though some positions in the portfolio had a great run over the last few quarters, I still consider them undervalued given an improved outlook and improving market perception of these assets. Some portfolio companies have only recently started to show signs of a turnaround, and I expect their earnings to grow materially over the next few years. I have also started to build new positions, some of which are not yet disclosed in this report. In 2007, a man started to play the violin at a metro station in Washington DC on a cold January morning. He played six Bach pieces for about 45 minutes. During that time, since it was rush hour, thousands of people went through the station. Three minutes went by until somebody noticed there was a musician playing. A middle-aged man slowed his pace and stopped for a few seconds — and then hurried up to meet his schedule. A minute later, the violinist received his first dollar tip: a woman threw money into the player’s violin case and continued to walk. A few minutes later, a man leaned against the wall to listen to him, but then looked at his watch and started to walk again. Clearly, he was late for work. The one who paid the most attention was a 3-year-old boy. His mother hurried him along, but the kid stopped to look at the violinist. Finally, the mother pushed hard and the child continued to walk, turning his head all the time. This action was repeated by several other children. All the parents, without exception, forced them to move on. In the 45 minutes the musician played, only 6 people stopped and stayed for a while. About 20 gave him money but continued to walk their normal pace. He collected $32. When he finished playing and silence took over, no one noticed. No one applauded, nor did anyone recognize him. The violinist was Joshua Bell, one of the best musicians in the world. He played one of the most intricate pieces ever written, with a violin worth $3.5 million. Two days before his playing in the subway, Joshua Bell sold out at a theater in Boston and the seats averaged $100. His performance in the metro was a social experiment by the Washington Post about the perception, taste and priorities of people. If we do not notice one of the best musicians in the world playing the best music ever written, what else are we missing? The story tells us that we tend to see only what we expect, and that our perception is heavily driven by social conditioning. In my mind, the Joshua Bell experiment also suggests why markets are inefficient, offering opportunities for independent thinkers: most market participants focus on the few companies and themes that dominate headlines, and so miss out on the many other opportunities readily available to them — but out of sight. The same goes for money managers: there are very few truly independent thinkers out there, and of those, very few can do as they like, as they are restrained by the customer base they serve. Many value investors I know have market-beating track records but are unable to attract funds because they are not skilled at marketing their product or because capital is not even trying to find them. Over the last few years, I have become somewhat obsessed with studying highly accomplished people in business, technology, sports and philosophy. The idea is to learn from them, according to Warren Buffett’s gospel: “Surround yourself with people better than you and you’ll drift in that direction.” One of my favorite “classes” is the U.S.-based National Public Radio (NPR) podcast “How I Built This” hosted by Guy Raz, where Guy allows successful entrepreneurs to tell their "rags to riches" story. Successful entrepreneurs pursue a practical approach to fulfil certain needs. Those could be entirely unfulfilled ones or improvements to existing products and services. According to most of the entrepreneurs interviewed, they were obsessed with developing a product or service, not making money (or so they say). All interviewees worked very hard in a very hands-on way. I am often surprised as to how simple their original setup was, and how much they did themselves to get the business off the ground. In most cases, it took years before they delegated key responsibilities, and they continued to be involved in many hands-on tasks as their businesses grew. It is astonishing what one can achieve by just picking up the phone. They approached everything as a learning opportunity, and failure never stopped them. Almost all of them faced severe resistance at multiple points in time, and it was their stubbornness and persistence that prevented them from giving up. Almost all interviewed entrepreneurs are good storytellers. I acknowledge that it is easy to tell your story once you are successful (and by the time you make it on national public radio, you are probably well trained in telling your story). At the end of the interview, Guy’s last question tends to be: “do you attribute your success to luck, hard work, a combination of both, or something else?” The answer tends to be: a combination of both. Most people credit a healthy portion of luck, but also their hard work, persistence, and the support from a few friends that helped along the way. An often-expressed view is that their approach and dedication made luck happen. “Making luck happen” really struck my interest. It took me a while to realize the power and relevance of this skill and that the concept applies to all walks of life. In fact, I have come to the conclusion that success — and happiness — depend on the way people approach life. Richard Wiseman, a British psychologist, researches the nature of luck and his studies have been published in the Skeptical Inquirer. According to him, people largely make their own good and bad fortune. He thinks it is possible to enhance the amount of luck that people encounter in their lives. In his conclusion, lucky people tend to create their own luck by four principles: 1) they are skilled at creating and noticing chance opportunities, 2) they make “lucky” decisions by listening to their intuition, 3) they create self-fulfilling prophecies via positive expectations, and 4) they adopt a resilient attitude that transforms bad luck into good. Wiseman thinks unlucky people are generally much more anxious than lucky people, and research has shown that anxiety disrupts people’s ability to notice the unexpected. The more they look, the less they see. Unlucky people miss chance opportunities because they are too focused on looking for something else. They go to parties intent to find the perfect partner and miss opportunities to make friends. They look through newspapers determined to find a certain job type in job advertisements and as a result miss other types of jobs. In contrast, lucky people are more relaxed and open, and as a result see what is there rather than just what they are looking for. Many lucky people go to considerable length to introduce chance and luck to their lives. Lucky people — who are optimistic, resilient, open to new ideas, and ready to take chances — are more likely to be successful entrepreneurs. Most people interested in investing with me by and large fit the personality criteria Wiseman describes as lucky. These people are entrepreneurial personalities themselves: They are actively looking for opportunities to learn and invest, and they are not shy to take chances. When speaking to them, I am often surprised as to how many people they know and how savvy they are on a broad range of topics — a clear sign of curiosity and reflection, but also of their willingness to reach out and try new things. This stands in stark contrast to the common retail investors I speak to. Most retail investors tend to complain about their banks, yet they do little to actively improve their own situation. Few of them invest in equities, as they are pursuing the common path of perceived safety: they hold cash, pay into a life insurance policy, and buy a house. Unfortunately, this means they are missing the possibility to compound capital at high rates of return. As iolite is approaching its 10th anniversary, I want to express my deepest gratitude to those who took a chance and entrusted me with their savings. I remain excited about the investment returns I think I can deliver over the next decades. Almost all my personal net worth remains invested in the portfolio, as I aim to compound my wealth alongside that of my co-investors. As always, I am happy to receive feedback and answer your questions. The Faroe Islands are a windswept archipelago between Denmark and Iceland. Their biggest employer is Bakkafrost, a farmed salmon producer. Bakkafrost is registered on the Oslo Stock exchange, and is one of the more prominent salmon producers in the Nordic region. We sat down with Robert to discuss his take on the stock and the future of salmon farming. Luke Schiefelbein: What about Bakkafrost initially caught your eye as a value investor? What catalyzed your entrance into the position? Robert Leitz: A few years ago, I went on a road trip through Western Norway and the number of fish farming sites caught my attention. I read up on the industry and the more I read, the more fascinated I became with the product and the value chain behind it. The salmon industry is benefitting from very favorable tailwinds: growing demand and structurally restricted supply. Regarding demand, protein consumption is growing due to population growth, growing disposable incomes, and zeitgeist. Fish is perceived to be healthy and has a lower environmental footprint than beef, pork and poultry. Regarding supply, wild catch is at capacity and growth only comes through aquaculture. It is very difficult and costly to increase aquaculture production of salmon given the lack of suitable locations, license restrictions, diminishing natural feedstock supplies, and biological hazards that come with mass production such as diseases and parasites.